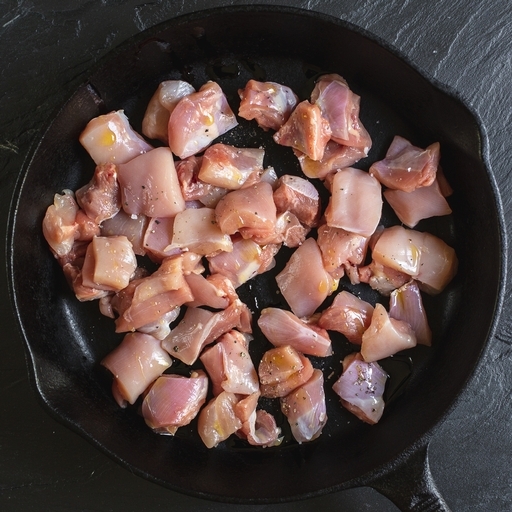 Full-flavoured organic chicken leg meat, diced by hand in our own butchery. We cut it to just the right size for stir fries, curries and homemade nuggets to make things easy in the kitchen. Organic and truly free range, our chickens spending their time grazing freely outdoors - resulting in lean, tender, really tasty meat. Serves 4. Leg meat is arguably tastier than breast meat but requires more cooking time to tenderize. Diced, it is ideal to cook into sauces and stews - the liquid helps it to slow cook without drying out. Brown it in a pan for 4-5 mins (this adds to the flavour) before adding your stock or sauce. Simmer for at least 30 mins.